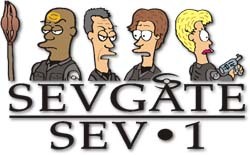 Welcome to our parody of Stargate SG1. We will add comic strips to this section regularly. The comic strips are all taken from the Sci-Fi TV Cartoon Contest where YOU get to write the punchlines. Comic Strip Archive Check out our archive of Sevgate comic strips. Stargate Links Here is your launching point to many other Stargate Websites. If you have your own Stargate website, be sure to submit it here! Sevnames Every Sevgate character has an alternative, sillier Sevname. Translations Read Sevgate in other languages!